I have a friend who once said that when she needed some peace and quiet from the noisiness of family life she would sit in the corner of her kitchen, with an apron over her head and pray her rosary. That’s about the sum total of last week. Multiple members of our family were sick. Matthew is finally toilet trained during both waking and sleeping hours. It has been a tough slog. 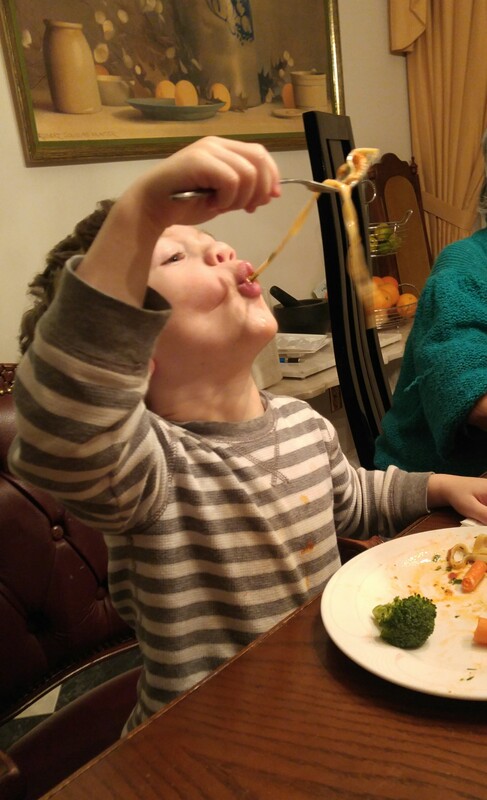 I succeeded in finding a little a pre-school program that works for both of us and our budget. A productive week yes, but I was tired, run down and irritable. By Wednesday morale was at its lowest. My husband is an expert at knowing how and when to gently ask the prickly questions without setting off my Irish, temper. After explaining my issues, his diagnosis was perspective, a break from endless burps, and all things having anything to do with Power Rangers, ninja’s and slap stick. The best thing for me to do when I am close to the equivalent of an adult meltdown is to get outdoors and re-charge my batteries with Mother Nature. I grabbed my kitchen torch, took the dog for a walk, de-iced the mailbox for the sixth time this winter and cleared my head in our frigid Canadian winter. It only took minutes for the snow and ice outside to snuff the glowing embers in my head and heart. 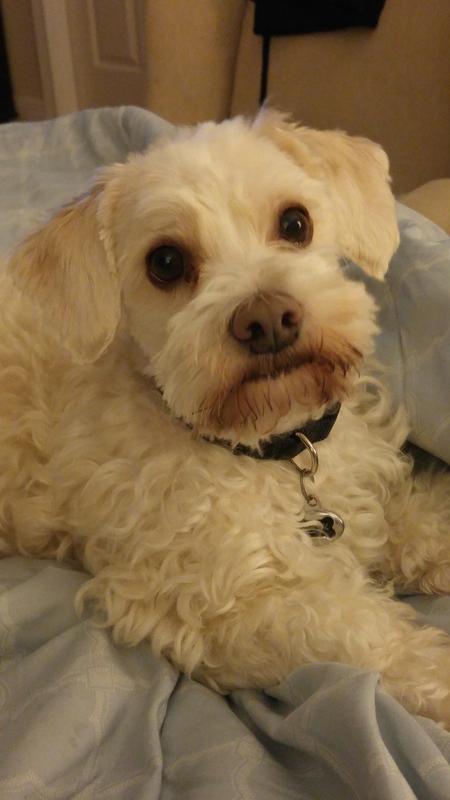 After a long talk with my Maker, I returned home with my faithful happy, yappy beast. My Makers answer is usually the same, “make soup, make bread”. 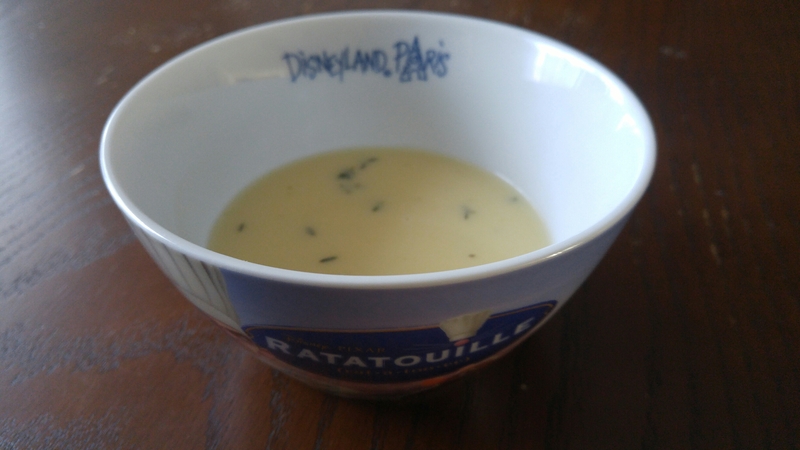 I listened, my heart stirred, le Tourain for soup and Casatiello for bread. 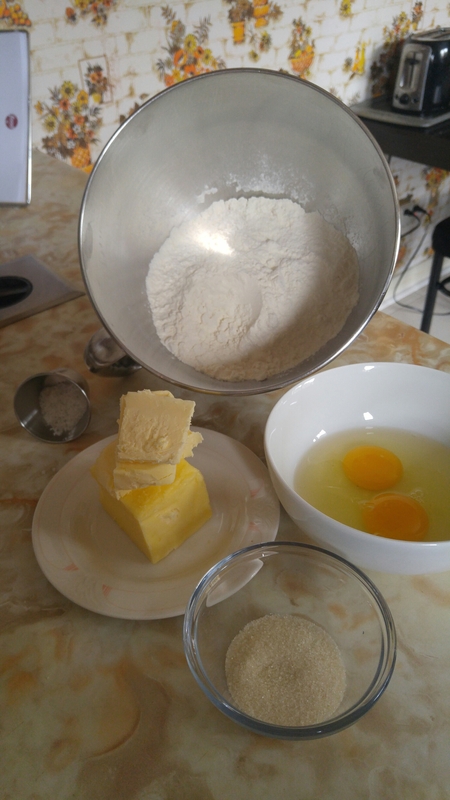 The next day, it was providence because I had all the necessary ingredients to make a restorative soup from just about nothing: three heads of garlic, a potato, some stock, a bouquet garni, a couple egg yolks, some seasoning and my Italian Easter bread. 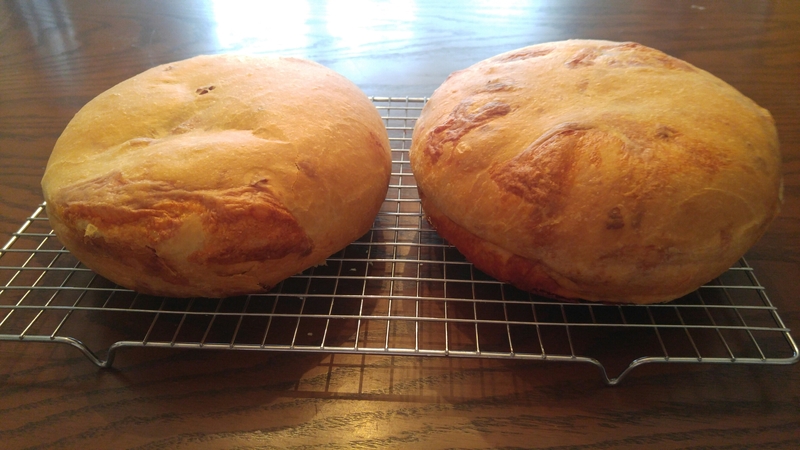 Casatiello appears on pg 137 of the Bread Baker’s Apprentice, but it isn’t the first time I have made this bread. One day while rummaging through Winner’s, I found and bought a copy of The Italian Baker by Carol Field. Her bread recipes are for Italian breads and sweets only. 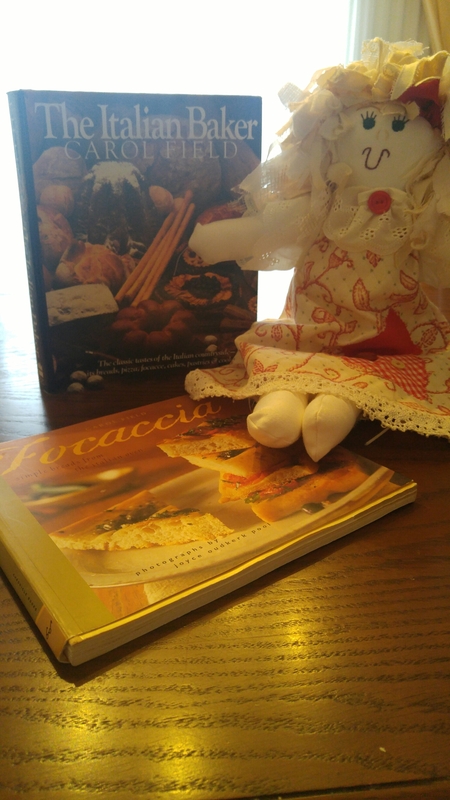 Her focaccia and Casatiello recipes are exceptional. Casatiello is an Easter bread from Naples. It is very much like the French brioche, full of sweet butter and eggs except that Casatiello takes a decidedly savoury spin as it is riddled with little pockets of intensely flavoured chunks of melty cheese and cured meat. It is insanely delicious bread, perfect for eating on its own and this might be heretical to suggest…the ultimate grilled cheese sandwich. 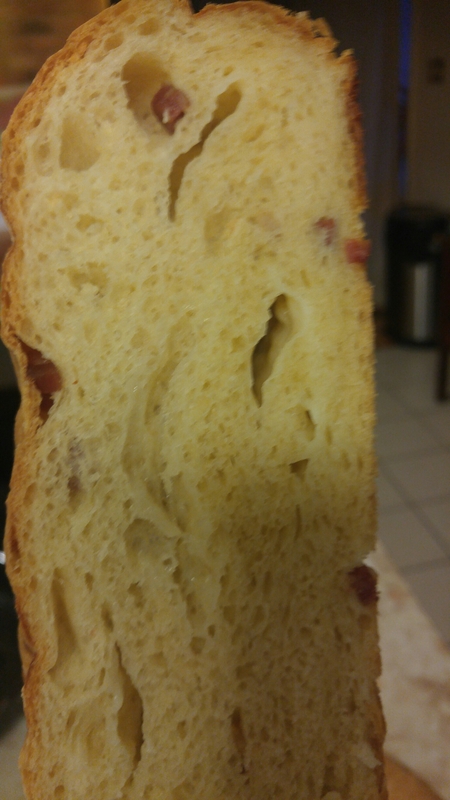 Casatiello only takes one day to make and that was a plus because I wanted this for my one serving of bread a week along with my garlic soup (le Tourain). 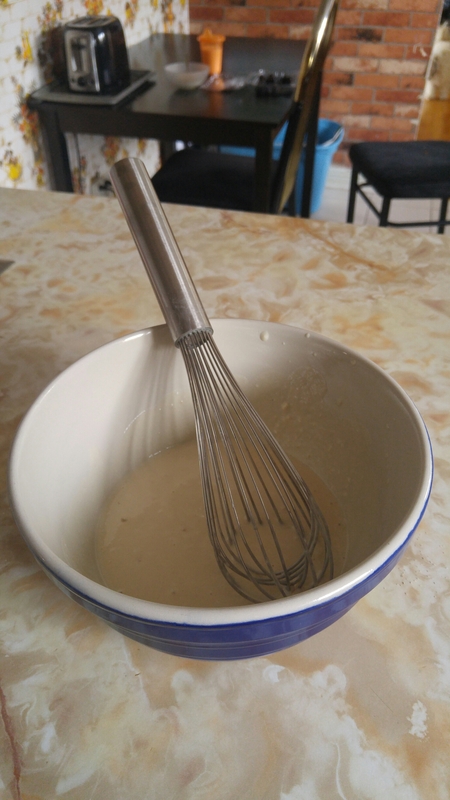 Most of the ingredients for the dough are pictured above. I loved the addition of buttermilk in this version as opposed to plain milk or water. I used fleur de sel in lieu of fine sea salt. 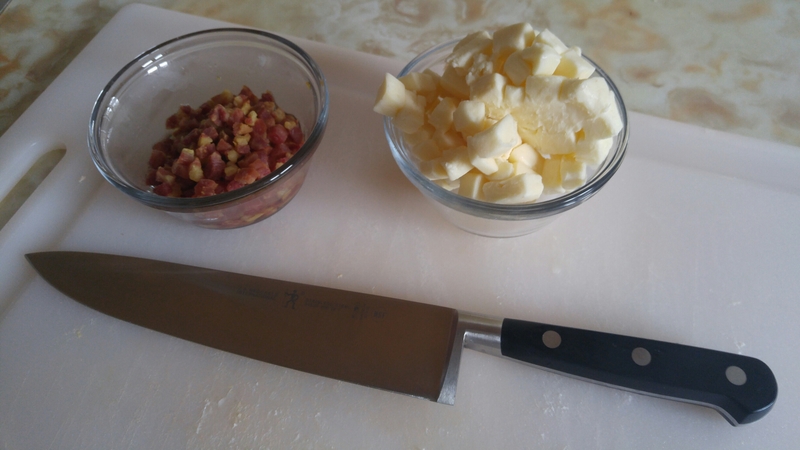 I had Taleggio in the fridge and spicy pancetta so I used these for the meat and cheese addition, adding in the rendered fat from cooking the meat and taking out an equal weight of the butter. 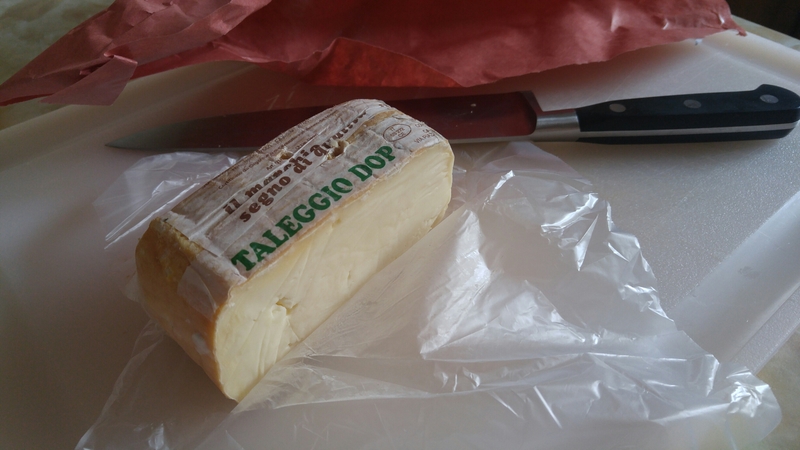 Taleggio is a DOP (denominazione di origine protetta) semi soft, washed rind, raw cows milk cheese. Washed rind means that the cheese, rather the rind will stink, you cut that off before you eat or cook with it. The ivory, gently salted interior of the cheese itself is so full of mushroomy, damp cellar flavour it is worth all the fuss over the smell and one of my all time favourite cows milk cheeses. I get mine from Il Negozio on Bank St, say hi to Mikey he won’t steer you wrong. Incidentally, a DOP product from Italy is a product that conforms to strict minimum quality standards in the ingredients, the method of production and other areas depending on what you are purchasing. Therefore, the purchase of a DOP cheese or wine is always a guarantee of decent quality. My dough took the better part of 2 hours to ferment to double the size. 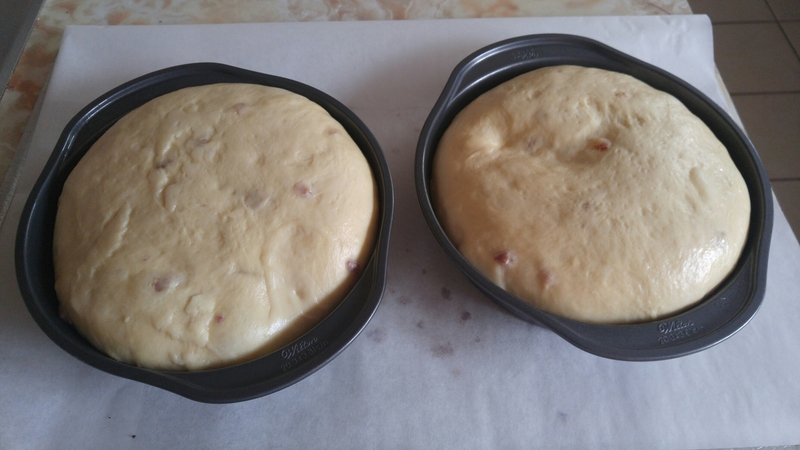 The dough can be baked in 8″ cake tins which I chose to do. I am however anxious to try baking them in paper bags as suggested, just to see if and how that method works. 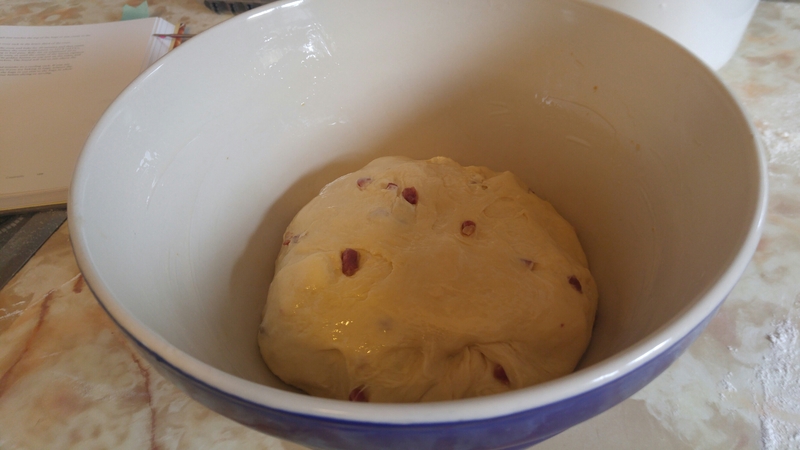 The dough was prooved in a little over an hour. My children only waited an hour before devouring this bread. They loved it, all three of them. Chris and I both rated the bread 18 out of a possible 20 points. The wow factor was all in the taste, we both loved how the cheese that had sank to the base of the loaf caramelized and became crispy. I like crust and this crust I found to be too soft for my palate. I will definitely re-visit this bread again and sooner than later, however I will play around with steam to create a crisper crust. At the end of the day, it was the perfect accompaniment for my body and soul restoring Tourain. Tourain can turn a juggernaut into a whimpering puppy, it is that soothing. Going back to my roots, Mediterranean flavours what I know and love best has helped put me back in sync with the rest of the world. I am ready to take on tomorrow.